WALT: improve our small ball skills and racket control skills. I can balance and move the tennis ball on my racket. I can use the ‘temple’ position to hit the ball across the net to my partner. I can use my skills to play games like ‘just juice’ and ‘lobster tennis’. Grasshopper tennis has been great fun and I have loved seeing you get involved and trying your best. You are right, it is hard to control your racket and make that ball go where you want it to! You have developed your skills and can hit the ball over the net and enjoy playing 'tennis' games. You don't have to win lots of points to have a great time! 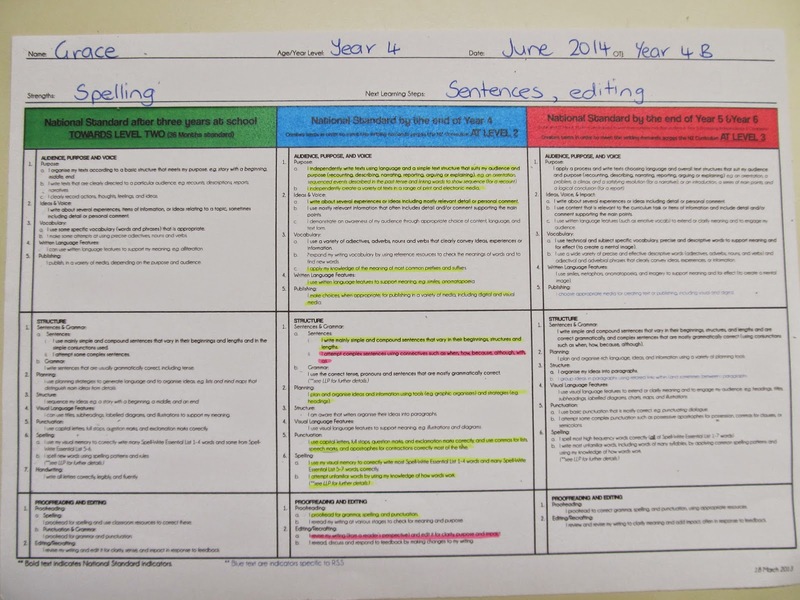 You are learning to summarise what you read by finding the main ideas and the key words. Remember to include all the main ideas so your summary is about the entire story. You are able to retell what you read, and have found the current affairs what, when, where questions helpful. We love to hear your ideas in class Grace so remember to use that 'big' voice. Task: We are going to create an i-movie. How will we know our movie is successful? What did/do you enjoy about this your integrity movie? You and your group used your time wisely. You had a plan and used it to create a fabulous movie with a clear message. You display integrity in your learning, trying your best and doing the right thing even when nobody is watching. Remember to complete you reflection. The questions are there as prompts to help you think about your learning...what have you learned about integrity? how are you going to use your learning? I am pleased that working in a group helped you to get lots of ideas. It is awesome when groups share and develop their ideas. You have used a ball to model kinetic and potential energy. Remember, the ball has potential (stored) energy when it is at the top of the slide because you have done work to put it there. It has kinetic energy when it is rolling (moving) down the slide. WALT: share our learning about telling the time. You have used your time telling skills to create a poster with a clear explanation about how time telling works. Your times are correct and this poster would be fabulous to share with children learning to tell the time. Remember, 15 minutes past or to is the same as 1/4 past or to. The big hand (minute hand) is 1/4 of the way around the clock.